Pre Race is not meant to replace that pure joy of your morning pre-training coffee or espresso. What Pre Race is designed to do is bring you an engineered precise blend of ingredients. One that you would dream of as an endurance athlete when performance matters. Pre Race does this without the harshness of coffee. This is a product that has gone aggressive and industrial and gets right down to the task of doing what it says it does: stimulate the nitric oxice (NO) system, help increase time to exhaustion and improve performance. With each serving of Pre Race you get 200 mg of caffeine, which helps set up the environment to kick start the intensity of your workout. Taurine, another product in Pre Race, and also found in the drink Red Bull is a neuroinhibitory transmitter. Taurine is quite a product in itself, helping anxiety control & stress management because it lowers cortisol, a hormone our body releases under stress. It is also extremely effective in helping motivation and fighting inflammation. Of interesting note due to its effects on calming, if you have any experience with fat loss, you’ll know that the body is most agreeable about giving up its fat stores when it is calm and not stressed. Before I list some other key ingredients and benefits, one thing I will add that has always interested me and I like when using Pre Race is: I haven’t had that jittery over-anxious feeling you can get with other caffeinated products. I really like this fact. Because of the absence of this hyped up or jittery feeling you can wonder if it it is even working. However, once underway Pre Race can turn a not so good day in to a VERY good day. Citrulline malate, another product found in Pre Race has always been a long time friend of mine. This product has been shown to stimulate nitric oxide, remove toxins and reduce lactate acid and ammonia levels in the body. These are all important things to a body and muscles under load when going full gas. While taking Pre Race before your big workout-s/race the effects can sound more than a bit fantastical, but these ingredients are solidly bound to nutritional science. If you are like myself, our days and weeks can be frought with daily challenges and some added fatigue that can take our intensity down a notch regardless of how committed we are for our key sessions. Pre Race is my Go-to product 1-2 x per week for my breakthrough sessions. 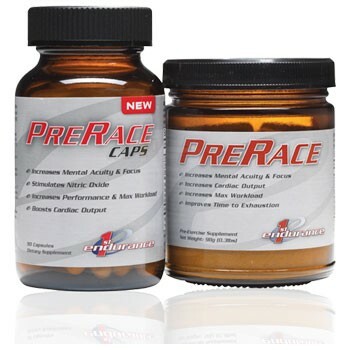 Pre Race comes in a powdered form and in capsules. When using the powder it can be added in with any pre-exercise or during-exercise drink like EFS consumed 30-1 hr before workouts. Best not mix with plain water as it does not taste good as I experienced once. First Endurance have not changed the formula for Pre Race simply because it continues to deliver what they set out for it to do. Provide endurance athletes with a product that increases mental stamina, increase time to exhaustion along with mental clarity and oxygenation of muscles. Back in the early 90s I was racing and training at the highest level - top 3 nationally ranked over the ½ Ironman distance in triathlon, I was doing well by everyone's standards. However, something was wrong. I was continually run down and always felt something was missing.Up to this point, I had enjoyed great coaches and training plans that were individualized and well thought out, along with a healthy eating plan. Some might just put my fatigue state down to training hard. I knew deep down it was more than that. I was not prepared to settle to live in a fog of fatigue everyday in pursuit of my goals. I went on my own personal crusade to understand more about the body's needs when pushing the limits, and how to give it extra support for the demands of living above a sedentary lifestyle. There is only so much sleep one can get and calories taken in before questions are asked if your body can meet the demands of your expectations. My very first product I went on to build my foundation of wellness was a high quality multi-vitamin-mineral. Within 7 days I experienced what I felt was a sense of coping better overall both mentally and physically. In my own words …I could now hold an intelligent conversation. My first lesson here was understanding that regardless of if you are an elite athlete or just getting off the couch working into your new exercise regimen, you want to give it everything it needs so it can push back. Using a multi vitamin-mineral was my start to pushing back. Not everyone is aware of the blessings of using sports supplements and how they should be used and viewed. Along with a balanced food regimen, using the right supplements at the right times can bring big advantages both short and long term. In many cases they can help directly improve athletic performance. Taking aholistic view by covering all aspects of your needs for exercise nutritionally through supplements to fill in the cracks has a flow-on effect. It's not just the benefit it has to support training. One of my clients came back to me and said that he acknowledged the training & recovery support it gave him, but the best thing for him personally was he was not as washed out (drained after sessions). Instead of justing wanting to lie down on a Sunday afternoon after training rather than taking the kids to the park, he now actually looked forward to it. The nutritional demands placed through exercise were now clearly being met for him. Having the ability to not only cope with, but perform at your job, enjoy your relationships while making time to exercise demand the right support nutritionally for maximal performance, both in the mental (cognitive) and muscular realms. These areas are all vital for the recovery for repeated bouts of exercise. Elite athletes tend to be more informed and aware of the benefits of sports nutrition than many regular age groupers shooting for glory, or those just making a start which is understandable. The physically active generally feel good after a workout. In fact, they might feel down if they do not get a workout in. This is often not the case for those starting out or renewing their athletic journey. Lack of conditioning often leads to higher levels of inflammation post workout. They just don’t get that mood lift of the more physically active. This group will often experience the feeling of cognitive fog along with muscle inflammation and in some cases feel depressed about the position they are in. Knowing just how far sports nutrition has come in the last 10-15 years, all things being equal like training commitment and genetic endowment, nutrition matters. It matters a lot! Emerging studies are endless on the benefits for performance & recovery with endurance athletes using amino acids, carbohydrates, electrolytes, proteins and other nutritional factors. One company that has it right in my opinion is First Endurance. They have a complete system of products specifically designed for endurance athletes from a multi-vitamin-mineral right through to their Ultragen recovery formula. Each of their products has a point of difference. Take for example their Multi V. One of the ingredients in this is carbogen, a patented enzyme blend that’s been clinically proven to increase time to exhaustion by 43%, reduce lactate levels and improve carbohydrate utilization. For individuals seeking out a competitive edge, that is massive. Like I say nutrition has come a long way in the last 10-15 years and many of these athletes can improve their state of wellness and physical performance to their true level of their talent – whatever level that may be. Say good bye to the nasty inflammations and fatigued immune systems with Optygen HP from First Endurance. This is the go-to-product for athletes if you are looking to reduce stress and inflammation from training hard along with helping take your performance to that next level. You do not need to be an elite athlete to use Optygen & Optygen HP. Stress comes from many directions in our lives, not just training everyday. Many athletes think that if they are not a pro-athlete, they are not training enough to need this type of support. I have always felt it’s the exact opposite. If you are holding down a job and training 1-2 x per day along with managing everything else that life encompasses, your body is under a lot of load. Possibly even more than if you were a pro-athlete. Optygen Hp is a product specifically designed to help manage the damaging effect of this load/stress. It's a synergy of ingredients designed to address a number of needs of endurance athletes and those looking to help with physical and cognitive vitality. Take for example, Rhodiola, one of the engredients in Optygen & Optygen HP. Tibetan sherpas use this to help them climb Mt Everest. It is a highly reliable product in reducing fatigue from prolonged stressful situations as associated with endurance & endurance sport. You could call it your anti-fatigue agent. It is slightly stimulatory, but not like caffeine. Optygen and Optygen HP also contain adaptogenic herbs with long names, the like of Panax Notoginseng extract, Eleutherococcus senticosis extract & Rosa Roxburghii fruit extract. These herbs effectively go towards helping you control cortisol levels when under stress along with extending time to exhaustion. When cortisol levels are reduced it helps you train at highly stressful levels without going into overtraining states. A place you do not want to go as an athlete striving to be the best you can be. So you are ready to head out the door and train the house down, pushing new limits? The good news is we are not finished yet. Optygen & Optygen HP also contain another key engredient: Beta-alanine. This is a non-essential amino acid that efficiently synthesises lactate thresholds so you can push to higher levels of output. The ability to push new boundaries and sustain a higher heartrate before the debilitating effects of lactic acids slows them down has to be good news. Over time the athlete molds their ability to improve endurance capacity for training and racing, leaving their old training buddies in the dust with new found levels of fitness. Last but not least, Optygen & Optygen HP contain a molecule that is known to help red blood cells dump oxygen into the muscle cells: phosphate. Optygen HP has this ingredient phosphate, which forms part of a compound called 2,3-diphoshoglycerate (2,3-DPG). When we train and race there is a whole unloading system that unlocks oxygen from the hemoglobin of your blood cells and delivers it to your muscle cells. In other words, it is not the muscles that limit the oxygen use, but rather the amount of oxygen that gets into them. The more oxygen you can deliver to your muscles, the higher your capacity in both training and competing. Multi V is like no other multi-vitamin mineral. It contains the highest quality, most bio-available vitamins and chelated (equals faster absorption) minerals available, designed for endurance athletes and those looking to maintain a high level of health support. This is important because you want to know that what you are buying is the best and will perform for you. First Endurance take this very seriously and do not compromise on quality. Their goal is to produce the best endurance products in the world. Multi V has a very unique enzyme blend (carbogen) that breaks down carbohydrates into simple glucose. This is a real boon for athletes because it means the glucose is readily accessible and available to working muscles, which will have you firing on all pistons. Also special is the fact that this process does not affect insulin while keeping blood glucose levels high for many hours. Great news for athletes and those wanting to stay on top of their energy levels. Talking numbers, a clinical trial conducted at the University of Dayton Human Performance lab found a 23% increase in blood glucose levels under high intensity exercise and lasting up to 5 hours. Furthermore, a massive decrease in blood lactate by some 58% along with a reduction in time to exhaustion and your perceived effort when exercising. Antioxidant support comes by way of ingredients like bioflavanoids, tumeric extract, grape seed extract and alpha lipoic acid. These antioxidants are considered to be the best antioxidants available. But what are antioxidants and why do we need them? Antioxidants are compounds in food that stop or delay damage to our cells. They are naturally found in many foods helping ward off cell damage by “cleaning up” or removing waist products in our cells called “free radicals” before they can do any harm. Exercise generates free radicals and causes muscle damage. Endurance athletes and those under stress need extra antioxidant support which we cannot get from food alone. A very reason to have in a multi vitamin if you are an endurance athlete. Ginkgo Biloba, a product in Multi V, warrants mentioning as well due to its many uses that the scope of this article could not possibly cover. What I will say is that clarity of thought along with circulation are two very important benefits of this product. Worth mentioning is that there is no calcium in Multi V. However, First Endurance is generally used as a system of products, i.e. athletes also use EFS & Ultragen on a typical day of training and they would then consume 600mg (60% RDA) from EFS and 900mg (90% RDA) from Ultragen of Calcium. Multi V is designed to be taken every day just like any other multi-vitamin tablet. If you are an endurance athlete, then First Endurance recommends you take it one to two hours before training or racing with your pre-exercise meal. I personally tend to train first thing in the morning, so I take them in the morning. Even if I end up not training in the morning, I still take them then because I feel it helps my mood and allows me to stay on top of my day, allowing me to cope with all sorts of stresses. I am oftened asked if people can split the dose of 3 tablets per day. It is however best you take all 3 tablets at once in order to get the required dosage of carbogen which is the patented blend in Multi V that maximises your carbohydrate utilization. Summing up, First Endurance's Multi V is a serious multi-vitamin mineral that works for both men and women who are looking to stay healthy and improve their performance in endurance sport. Ultragen recovery drink, if consumed in the magic 30 minute window post exercise, is the most advanced recovery formula ever developed for endurance athletes. This is a recovery drink that has shown in clinical research to maximize recovery and give you the edge you are looking for. It is a recovery drink that promises what it delivers & more. You will notice that it goes into full solution quickly when mixed with water and is not clumpy. When a recovery formula’s containing protein in water mixes well, it is a very good indicator of how well the stomach will break them down. Most endurance athletes have experienced that constant craving for food post training along with lethargicness and wondering how the next day's training will go. Yes, you might have trained hard, but more often than not your glycogen has been driven low from the exercise you have done resulting in massive fluctuations in your energy cycle post session. This can often last for hours, resulting in a lot of excess calories being taken in trying to satisfy the need to restore your energy. Using a comprehensive drink like Ultragen designed to restore your gylcogen levels quickly and deliver just the right amount of nutrients at the right time will have you making better food choices in the following hours. Each serving of Ultragen is packed with 4500 mg of branched chain amino acids which, when consumed in minutes, get right to work on having your muscles recovered and ready for the next day. Along with this, you have whey protein isolates & hydrolysates that are dissolved over several hours, meaning they come in behind to back up the BCAAs in the recovery process. First Endurance Ultragen recovery drink delivers 20 grams in total of these high qaulity cutting edge proteins. You also get 60 grams of fast acting carbohydrates. The carbohydrates are critical to making sure your gylcogen is increased to allow the protein to be completely absorbed by the muscles. 6 grams of glutamine, which is essential in the recovery process, are also present with each serving. It is this synergy of ingredients that makes Ultragen recovery formula the preferred drink chosen by endurance athletes. It comes in 5 flavours: chocolate, orange creamsicle, tropical punch, cappucino & vanilla. To get the best out of each serving immediately after your training sessions always mix with water (only) for best absorbtion. However Ultragen can be enjoyed as a smoothie with added fruit or your favorite ingredient as a pre training/race breakfast or a substituted meal at a time of day of your choosing. The EFS liquid shot is like no other. No more tearing off the top of a sticky gel and having to consume it all at once. No more dealing with the refuse of wrappers that come with some other products. The EFS liquid shots come in 130 ml reusable hand held flasks. Just pop the top & take a small sip. What you don’t use you can pop it back in the fridge and keep it for the next training session or race. The Liquid shot outperforms other gels in all areas. One reason is it does not contain gelling agents or gaur gum. These are the last things an endurance athlete wants to use. Gelling agents and gaur gum slows down absorbtion and can cause stomach issues. Each shot contains one 400 calorie serving which far outdoes other gels, which generally contain little over 100 calorie servings. Further to this, in each EFS shot you get a whopping 1000 mg of amino acids made up of 500 mg luciene, 250 mg isoluciene and 250 mg valine. BCAAS are very important in endurance exercise. The body burns a lot of aminos/proteins under intense exercise. By training with a formula that combines these amino acids you are replacing what is being burned and setting the body up to absorb the work you are doing and recover faster for your next training session or race. EFS liquid shots have all five electrolytes to keep the system functioning. This is important to keep the body in balance. It is no good to just have high sodium and one or two other electrolytes in the belief sodium is all you need to avoid cramping. It isn’t. Each shot contains 150 mg calcium, 120 mg magnesium, 600mg chloride, 400 mg sodium and 290 mg potassium to have you firing on all pistons. Best of all, First Endurance have done a great job with the flavours. My favorite is the Vanilla.